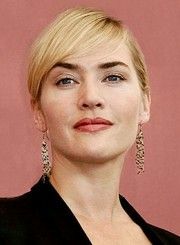 Kate Elizabeth Winslet (born 5 October 1975), is an English actress and singer. She was the youngest person to accrue six Academy Award nominations and won the Academy Award for Best Actress for The Reader (2008). She has won awards from the Screen Actors Guild, British Academy of Film and Television Arts and the Hollywood Foreign Press Association among others and has been nominated twice for an Emmy Award for television acting, winning once for her role as Mildred Pierce in the 2011 mini-series of the same name. In 2012 she received the Honorary César Award for her life and acting career. She made her film debut in Heavenly Creatures (1994), for which she received her first notable critical praise. She achieved recognition for her subsequent work in a supporting role in Sense and Sensibility (1995) and for her leading role in Titanic (1997), the highest-grossing film in the world at the time.